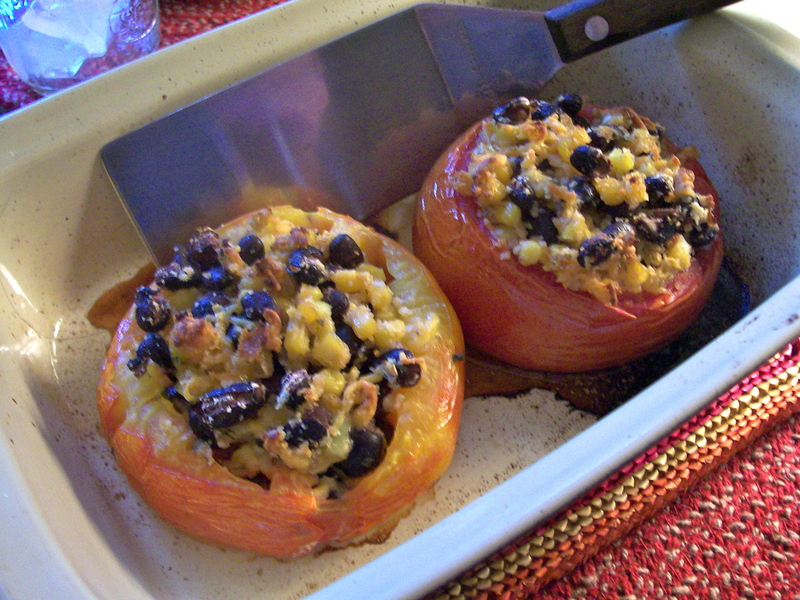 Looking back over my more recent blog postings I was struck by how many contained the word “stuffed”: Stuffed Peppers, Stuffed Zucchini, Stuffed Mushrooms. I didn’t realize until now how many vegetables I prepare with a stuffing that seems to make the base veggie as well as the stuffing itself so much better–one enhances the other. Well, if you can stand another such recipe this one uses those nice big tomatoes fresh from the garden. You know, the ones that could be a meal in themselves. These big boys are juicy and tender, and contain a filling on the order of a salsa, but better because of the cheese and breadcrumbs. I served them with a fillet of tilapia, lightly crisped with a cornmeal crust, and a mixed greens salad. This was so good my husband has requested that I make it all again very soon. I only made two but next time I will make the full recipe of four, as I think they would make a great lunch just rewarmed in the microwave. The nice thing about this recipe is that you can make only half, or double it and make 8 if you’re feeding a larger group. 2 scallions, white and green parts separated, and thinly sliced. 1 cup fresh bread crumbs, divided. I used prepared seasoned bread crumbs, 1/2 cup total, divided. 1. Preheat oven to 450 degrees. Coat an 8″ square pan with non-stick spray. 3. In a medium skillet heat 2 teaspoons oil over medium heat. Add corn and scallion whites and cook until crisp-tender, about 3 minutes. 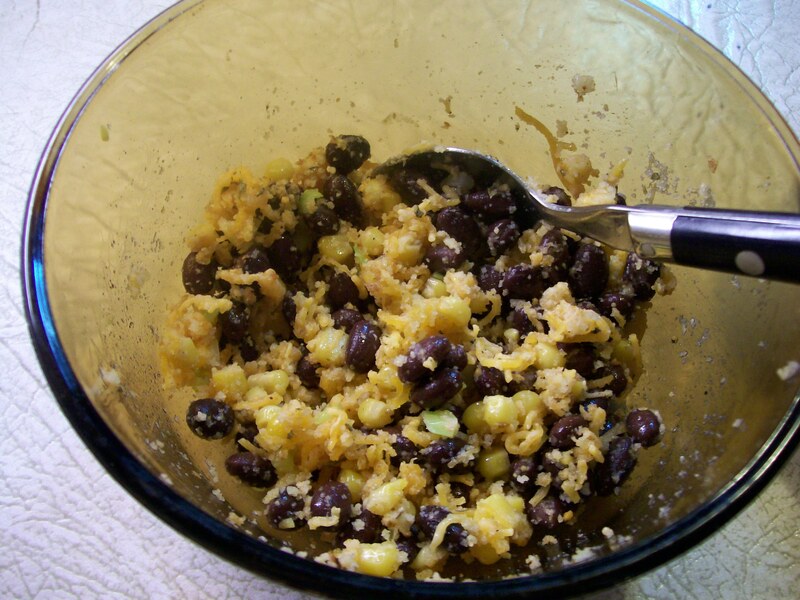 Transfer to a medium bowl and stir in the jalapeño, black beans, 1/4 cup cheddar, 1/2 cup bread crumbs (or 1/4 cup seasoned bread crumbs) and lime juice. Season with salt and pepper. Mix the filling ingredients all together. 4. Turn the tomatoes right side up. Sprinkle the insides with salt and pepper, and spray or brush the skins with olive oil. Place in baking dish. Fill the tomatoes with corn mixture. Combine remaining 1/4 cup cheese, 1/2 cup bread crumbs (1/4 cup seasoned crumbs), and 2 teaspoons oil. season with salt and pepper and divide among the tomatoes. 5. Tent loosely with foil and bake 10 minutes. 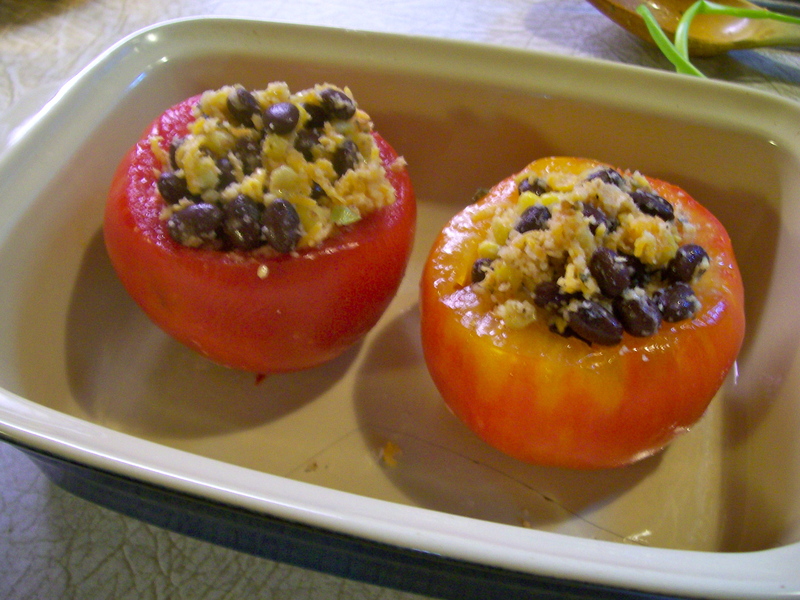 Uncover and bake until tomatoes are soft and breadcrumb topping is deep golden, about 5 minutes more. Spread reserved tomato flesh on rustic bread–a crusty loaf, split in half lengthwise. Drizzle with olive oil and season with salt, pepper, and a sprinkle of herbs (any). Bake in a 450 degree oven until the edges are brown and crisp, about 10 minutes. Watch carefully so it doesn’t get too browned. Serve with more olive oil for dipping.